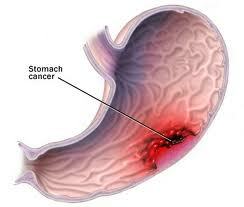 Stomach Cancer mostly occurs in older individuals and frequently starts at the inflamed stomach lining site. Many scientists suggest that this inflammation results in the stomach cancer, rather than the cause of the stomach cancer. Other experts believe that Stomach Cancer is caused by stomach ulcer, but most patients with stomach cancer and ulcers possibly had an undetected cancer before developing ulcers. H pylory bacterium (helicobacter pylori) that plays role in producing duodenal ulcer, can also cause certain stomach cancers. Stomach polyps are thought to be cancer’s forerunners and must be removed. Cancer is likely to occur in individuals with polyp (noncancerous round growth) larger than 3/4 inches; or few polyps. Certain dietary factors such as low intake of fruits and green leafy vegetables; high intake of nitrates, carbohydrates or salt are thought to play a role in developing of stomach cancers. However, non of such factors have been proved to cause cancer. In the United States, Stomach Cancer, the 7th common cause of death and is most likely to happen in blacks, poor people, and individuals living in the North. The symptoms in the early stages of Stomach Cancer are vague and ignored. When symptoms progress, they can help find where the cancer in the stomach is located. For example, discomfort or fullness feeling after a taking meal, can indicate the cancer located in the stomach’s lower portion. Weakness and weight loss are usually caused by inability to absorb some minerals and vitamins or by difficulty in eating. Anemia can be caused by very gradual bleeding which results in no other symptoms. Sometimes, an individual can pass black tarry stool (melena) or vomit large blood amount (hematemesis). When cancer of the stomach is progressed, a physician can feel a mass through the wall of the abdomen.Even in early stage, a small tumor of stomach can metastasize (spread) to distant areas. The tumor spread can result in cancerous skin’s nodules, ascites (abdominal fluid collection), jaundice, and liver enlargement. 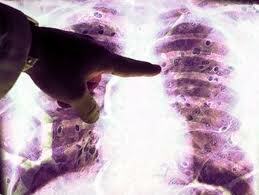 The spreading cancers can also weaken bones, causing bone fracture. A stomach cancer’s symptoms can be confused with symptoms of a peptic ulcers. If the symptoms do not clear up after a patient uses ulcer medications or the symptoms consisting of losing weight, doctor suggest stomach cancer. X-Rays barium tests to outline stomach surface changes, frequently performed, but they seldom show small, early stomach cancers. Endoscopy is the best procedure to view the person’s stomach directly. Other tests include:obtaining biopsy for testing under the microscope; and checking the H pylori bacterium( helibacter pylori). Stomach polyps, which are noncancerous, must be removed with using endoscopy. If Carcinoma is confined to the patient’s stomach, operation is generally done to attempt to cure it. 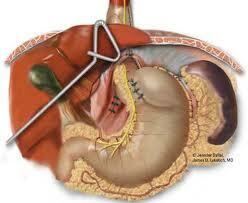 All or most of the stomach and surrounding lymph nodes are surgically removed. The prognosis is relatively good if the cancer has not invaded the wall of stomach too deeply. If the Carcinoma has spread to distant sites, the treatment goal is to relieve the symptoms and make life longer. Radiation therapy and Chemotherapy can ease the symptoms. In some cases, the surgery is performed to subside the symptoms. 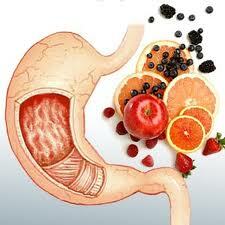 For example, if the food passage is obstructed at the stomach’s far end, a bypass surgery can relieve the symptoms. 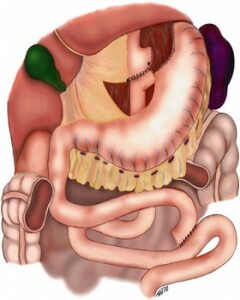 A connection between small intestine and stomach is made that allows food to pass. This connection relieves obstruction symptoms (vomiting and pain) for a while. Radiation therapy and Chemotherapy results are better for gastric lymphoma than for carcinoma. Longer survival and sometimes, cure, are probable.